In a continuation from the last post, as promised, here is our lunchtime routine. One of my parapros sits with the students at the group table while they play with sensory toys. My other parapro goes to the cafeteria with empty plates. The cafeteria workers serve my students' lunches onto these plates instead of trays. Mrs. Pfefferle uses one of the cafeteria carts to bring the lunch plates back to the class kitchen and puts them on the counter. I pour drinks and put the cups at each students' place at the table. I call students, one at a time, into the bathroom to wash their hands. After washing hands, the student goes into the kitchen. They get their plate from the counter and carry it to their seat. Then I call the next student. When a student is finished eating, they carry their plate to the trash can, scrape their food into the trash, then bring their cup to the sink and pour out what's left of their drink. We then help them wash their plate, silverware and cup, rinse them, and put them in the dish drain. After finishing their dishes, the student goes back to their seat at the table so that they can continue to have conversations with their friends. 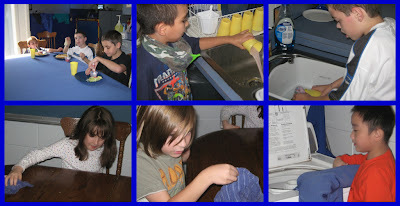 When everyone is finished eating and washing dishes, we pass around a soapy cloth and each student washes their part of the table. The students go back to the table to play with sensory toys, one student puts the tablecloth and dishtowels in the washing machine and starts the laundry, then I call students one at a time to come back into the bathroom to brush their teeth. 0 Responses to "Lunch, part 2"